"The World's Light," The Jesus Database, an online annotated inventory of the traditions concerning the life and teachings of Jesus. Dr. Gregory C. Jenks, FaithFutures Foundation. III.40, III.42, Against the Heathen, Athanasius of Alexandria, c. 318. I.2, VII.25, Ecclesiastical History, Eusebius of Caesarea, (c. 320). "Consider, then, brethren, if perchance John is not one of those mountains concerning whom we sang a little while ago, "I have lifted up mine eyes to the mountains, from whence shall come my help.'" "The light of minds is above minds and surpasses all minds. This was that life by which all things were made." "Thus, therefore all those to whom Christ came were not fit to see Him: upon John He shed the beams of His light; and by means of him confessing himself to have been irradiated and enlightened, not claiming to be one who irradiates and enlightens, He is known who enlightens, He is known who illuminates, He is known who fills." "Christ's Titles of Honor; His Coming: His Incarnation; and the Revelation of His Glory," John 1:1-14, Martin Luther, c. 1521. "This word "the" points out to us a peculiar and choice thing above all others, and puts a difference between this "Word", which is the Son of God, and the laws of God, which are also called the word of God." "The plainest reason why the Son of God is called the Word, seems to be, that as our words explain our minds to others, so was the Son of God sent in order to reveal his Father's mind to the world." "When all things began to be made by the Word: in the beginning of heaven and earth, and this whole frame of created beings, the Word existed, without any beginning. He was when all things began to be, whatsoever had a beginning." "...in this dark, fallen world, or in mankind "sitting in darkness and the shadow of death," with no ability to find the way either of truth or of holiness. In this thick darkness, and consequent intellectual and moral obliquity, "the light of the Word" shineth--by all the rays whether of natural or revealed teaching which men (apart from the Incarnation of the Word) are favored with"
"The True Tabernacle, and Its Glory of Grace and Peace," John 1:14,17, Charles H. Spurgeon, 1885. "There is now no spot on earth where God dwells in preference to another...Yet there is a true house of, a real temple of the infinite, a living abode of the Godhead." "God exhibits his creative power through the Word, and manifests his will through the Word." "Exposition of John 1:1-34," Charles H. Spurgeon, 1892. "You may sometimes call the darkness, the ignorance of men, or the sin of men. If you like, you may call it the wisdom of men, and the righteousness of men, for that is only another form of the same darkness. 'The light shineth in darkness; and the darkness comprehended it not.'" "Simplicity and Sublimity of Salvation," John 1:11-13, Charles H. Spurgeon, 1892. "That religion which leaves out the person of Christ, has left out the essential point. Thou art not saved by believing a doctrine, though it is well for thee to believe it if it be true. Thou art not saved by practising an ordinance, though thou shouldst practise it if thou art one of those to whom it belongs. Thou art not saved by any belief except this, believing on Christ's name, and receiving him." Commentary, John 1:(1-9), 10-18, Karoline Lewis, Preaching This Week, WorkingPreacher.org, 2015. "The fourth evangelist understands that God’s promise to be with God’s people wherever they go has now taken on a different representation in Jesus." "So perhaps the opportunity before us, Dear Partner, on this second – and last – Sunday of Christmas, is to treat it as the first Sunday of a year where we emulate and actualize God's activity to come among us in grace, mercy and love that the light might continue shining on in even the darkest of places." "How have you come to think of 'the Word becoming flesh?' What does this wonder mean to you?" "Confession," Andrew Prior, First Impressions, 2015. Evangelio Comentario del San Juan 1:[1-9], 10-18 por Darío Barolin, Working Preacher, 2015. Commentary, John 1:(1-9), 10-18, Karyn Wiseman, Preaching This Week, WorkingPreacher.org, 2014. "Pitching tent means coming to be fully part of the world in which you live and minister." "An Unsentimental Christmas Season," David Lose, Dear Working Preacher, 2014. "Jesus came that we might become children of God. Children that is, who are not dominated by the circumstances in which we find ourselves, not defined by our limitations or hurts, and whose destiny is not controlled by others. Rather, we are those persons who know ourselves to be God's own beloved children." "Why Lead with Logos Christology?" Clint Schnekloth, Question the Text, 2014. "Enfleshed," Melissa Bane Sevier, Contemplative Viewfinder, 2014. "God Came Down," Faith Element, 2014. Evangelio Comentario , Linda M. Eastwood, Working Preacher, 2014. "To See the Face of God," Andrew Prior, 2014. Commentary, Karl Kuhn, Working Preacher, 2013. Word Made Flesh, Narrative Lectionary Podcast, Rolf Jacobson, Craig Koester and Kathryn Schifferdecker, 2013. "Light and Darkness, Grace Upon Grace," commentary and discussion, RevGalBlogPals, 2013. "The Politics of Babies, Bodies, and Abandonment," John 1:1-18, Political Theology Today, 2013. "The Light in the World," Beth Scibienski, A Thousand Words of Inspiration, 2013. Commentary, John 1:1-14, Craig a. Satterlee, Preaching This Week, WorkingPreacher.org, 2012. "For an alternative approach, rather than helping our hearers to see the light of Christ shining in the darkness, preachers might help them to hear Jesus as God’s love song, singing life into the world’s babble, chaos, and voices of death." "A Christmas Message," the Rev. Dr. Janet H. Hunt, Dancing with the Word, 2012. Comentario del Evangelio por Iris Barrientos, Juan 1:1-14, Working Preacher, 2012. Holy Textures, Understanding the Bible in its own time and in ours, Matthew 1:18-25, David Ewart, 2014. "Just as in Genesis the Word was God's original self-revelation as Creator of all; in the Gospel of John, the Son is the revelation of God's heart as Lover of all." The Prologue, audio telling, story in episodes, graphic, audio and written commentaries. Go Tell Communications, Biblical Storytelling for the Global Village, 2011. "Christmas and the Clash of Civilizations," pdf study guide, Robert B. Kruschwitz, (other resources at) "Christmas and Epiphany Library," Christian Reflection, The Center for Christian Ethics at Baylor University, 2011. Focus article: "Christmas and the Clash of Civilizations," Donald Heinz. "Particles in the Cosmic Crib," Peter Woods, I Am Listening, 2011. "The Word before the Baby Jesus," Russell Rathbun, The Hardest Question, 2011. "Why does Word that is God nearly completely disappear from the rest of the scriptures?" "Bring It!" Alyce M. McKenzie, Edgy Exegesis, Patheos, 2011. "First Thoughts on Year C Passages in the Lectionary," Christmas 2, William Loader, Murdoch University, Uniting Church in Australia. "It makes sense to link together: the divine Law, the order of creation and Wisdom. It is like saying: here we see the real meaning of life, the principle which holds all things together, the way God intended things to be." Commentary, John 1:(1-9), 10-18 (Christmas 2), Ginger Barfield, Preaching This Week, WorkingPreacher.org, 2010. "The gospel message does not go forward without witnesses like John, and one of the tasks in this sermon is to help show what it looks like to point our fingers towards Jesus. In the age of talk of missional churches, how does that work out practically? How can we point towards Jesus in mission in such a way that others come to know him and come to know and love God?" Commentary, John 1:[1-9] 10-18 (Christmas 2), Holly Hearon, Preaching This Week, WorkingPreacher.org, 2009. John 1:(1-9), 10-18, Christmas 2, Comments (commentary) and Clippings (technical notes for in-depth study), Chris Haslam, Anglican Diocese of Montreal. Exegetical Notes, Christmas 2, by Brian Stoffregen at CrossMarks Christian Resources. "It is hard to express love in mere words, so poems and works of art are created to try and capture the emotion of love. Christianity is filled with art and songs, because it is a religion based on God's love for us here on earth." 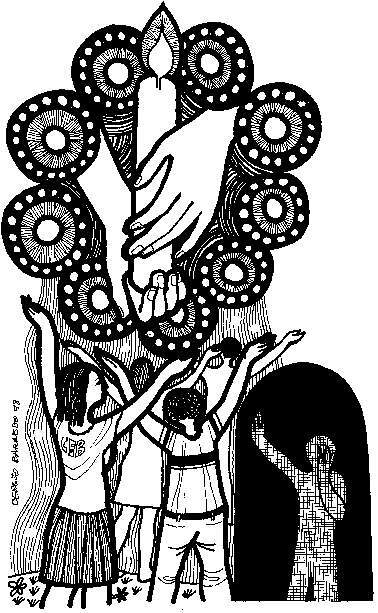 Lectionary Blogging, John 1:1-18, John Petty, Progressive Involvement, 2010. "The fourth gospel is all about the community indwelling with each other and with God. It is not about the individual's appropriation of Jesus, but rather God's appropriation of humanity through Christ and how God lives in the greatest intimacy with his followers. All through the gospel the words are plural, not singular." John 1:1-14, Christmas, Comments (commentary) and Clippings (technical notes for in-depth study), Chris Haslam, Anglican Diocese of Montreal. "I think to myself, 'What a Wonderful World,'" Peter Woods I Am Listening, Christmas Eve/Day, 2009. "Jesus being re-incarnated in every Christ follower as his word of love, compassion, forgiveness, healing, peace; all of it comes and takes flesh in your life and mine." "The Word Became Flesh," Gospel Analysis, Sermons from Seattle, Pastor Edward F. Markquart, Grace Lutheran Church, Seattle, Washington. Detailed background and exegesis. Join the Feast, John 1:(1-9) 10-18, Brian Blount, Union PSCE, 2009. "A picture is worth a thousand words. Here, one Word is worth a thousand words." "Two Languages," study guide, Robert B. Kruschwitz, (other resources at) "Moral Landscape of Creation," Christian Reflection, The Center for Christian Ethics at Baylor University, 2001. "Home for Christmas," Pilgrim Preaching, Keeping company with biblical texts and the people who hear and preach them, a weblog for preaching, by Mary Hinkle, Luther Seminary. "In 'The Pivot of John's Prologue,' New Testament Studies 27 (1980) : 1-31, Alan Culpepper argues that the prologue is a chiasm with a center point at v. 12b: 'he gave power to become children of God.'" "He Who Comes after Me Stands among You," "The Word Made Flesh," Rev. Bryan Findlayson, Lectionary Bible Studies and Sermons, Pumpkin Cottage Ministry Resources. Includes detailed textual notes. Paraphrase of John 1:1-18, by Jim Stamper. Another reflection by Rev Gibbs. "What Child is This? (John 1:1-8)" by Robert Deffinbaugh at the Biblical Studies Foundation. "John?s prologue provides us with insights which enhance our understanding and appreciation of the birth narratives of Matthew and Luke. These two Gospels highlight the humanity of our Lord, without denying His deity. John?s Gospel highlights the deity of Jesus Christ, without minimizing His humanity." "The appropriate word to be used in connection with 'the road traveled' by the authors of both Genesis and Exodus is 'grace,' for grace represents the love of God incarnate in his saving initiative. John now interpolates this word at this point (1:14) to exegete this new genesis and exodus in the coming of Christ." "Gospel in the Liturgy," The Catholic Encyclopedia. Section 5 discusses John 1:1-14 read at the conclusion of the Mass. "How Semitic Was John? Rethinking the Hellenistic Background to John 1:1," David A Reed, Anglican Theological Review, 2003. Bertram, Robert W., "A Christmas Crossing, John 1:1-18," Currents in Theology and Mission, 1981. Black, C. Clifton, II, "St. Thomas's Commentary on the Johannine Prologue: Some Reflections on Its Character and Implications," The Catholic Biblical Quarterly, 1986. Campbell, Charles L., "John 1:1-14," Interpretation, 1995. Carter, Warren, "The Prologue and John's Gospel: Function, Symbol and the Definitive Word," Journal for the Study of the New Testament, 1990. Cook, W. Robert, "The 'Glory' Motif in the Johannine Corpus," Journal of the Evangelical Theological Society, 1984. Cowan, Christopher, "The Father and Son in the Fourth Gospel: Johannine Subordination Revisited," Journal of the Evangelical Theological Society, 2006. Giblin, Charles Homer, S.J., "Two Complementary Literary Structures in John 1:1-18," Journal of Biblical Literature, 1985. Glancy, Jennifer A., "Torture: Flesh, Truth, and the Fourth Gospel," Biblical Interpretation, 2005. Goetz, Ronald, "Penetrating the Darkness," The Christian Century, 1988. Graves, Mike, "On Having a Word from God - Genesis 1:1-5; John 1:1-18," Journal for Preachers, 2003. Kelber, Werner H., "The Birth of a Beginning: John 1:1-18," Semeia, 1991. Knight, George A.F., "The Light of God in Action," The Christian Century, 1998. Kysar, Robert, "Rudolph Bultmann's Interpretation of the Concept of Creation in John 1:3-4," The Catholic Biblical Quarterly, 1970. Le Frois, Bernard J., "Spiritual Motherhood of Mary in John 1:13," The Catholic Biblical Quarterly, 1951. MacLeod, David J., "The Benefits of the Incarnation of the Word: John 1:15-18," Bibliotheca Sacra, 2004. MacLeod, David J., "The Creation of the Universe by the Word: John 1:3-5," Bibliotheca Sacra, 2003. MacLeod, David J., "The Eternality and Deity of the Word: John 1:1-2," Bibliotheca Sacra, 2003. MacLeod, David J., "The Incarnation of the Word: John 1:14," Bibliotheca Sacra, 2004. MacLeod, David J., "The Reaction of the World to the Word: John 1:10-13," Bibliotheca Sacra, 2003. MacLeod, David J., "The Witness of John the Baptist to the Word: John 1:6-9," Bibliotheca Sacra, 2003. Madigan, Daniel A., SJ, "People of the Word: Reading John with a Muslim," Review & Expositor, 2007. Marrow, Stanley B., "Kosmos in John," The Catholic Biblical Quarterly, 2002. Meagher, John C., "John 1:14 and the New Temple," Journal of Biblical Literature, 1969. Miller, Ed. L., "The Johannine Origins of the Johannine Logos," The Journal of Biblical Literature, 1993. Newman, Barbara, trans. & introduction, "Commentary on the Johannine Prologue (Hildegard of Bingen)," Theology Today, 2003. Nutu, Liliana M., "The Seduction of Words and Flesh and the Desire of God: A Poststructuralist Reading of John 1:1, 14 and The Pillow Book," Biblical Interpretation, 2003. Pederson, Ann Milliken, "Christmas and the Reality of Incarnation: Finitum capax infiniti," Word & World, 2007. Pohl, Christine D., "Homeward Bound," The Christian Century, 2005. Polhill, John B., "John 1-4: The Revelation of True Life," Review & Expositor, 1988. Pryor, John W., "Jesus and Israel in the Fourth Gospel - John 1:11," Novum Testamentum, 1990. Pryor, John W., "Of the Virgin Birth or the Birth of Christians? The Text of John 1:13 Once More," Novum Testamentum, 1985. Reinhartz, Adele, "'And the Word Was Begotten': Divine Epigenesis in the Gospel of John," Semeia, 1999. Rissi, Mathias, "Expository Article: John 1:1-18," Interpretation, 1977. Schlatter, Fredric W., S.J., "The Problem of John 1:3b-4a," The Catholic Biblical Quarterly, 1972. Staley, Jeff, "The Structure of John's Prologue: Its Implications for the Gospel's Narrative Structure," Catholic Biblical Quarterly, 1986. Stapleton, John M., "Resounding the Gospel," Theology Today, 2007. Tobin, Thomas H., S.J., "The Prologue of John and Hellenistic Jewish Speculation," The Catholic Biblical Quarterly, 1990. Ucko, Hans, "Full of Grace and Truth: Bible Study on John 1:14-18," Ecumenical Review, 2004. Waetjen, Herman C., "LOGOS PROS TON THEON and the Objectification of Truth in the Prologue of the Fourth Gospel," The Catholic Biblical Quarterly, 2001. "Christmastide: A Reminder Where Our Hearts Belong," the Rev. William McCord Thigpen, III, Day 1, 2010. "The Word Became Flesh," Pastor Edward F. Markquart, Grace Lutheran Church, Seattle, Washington. Father Andrew M. Greeley, "Priest, Author, Sociologist," Commentary and Homily, 2002. Worshiping with Children, Christmas 2, Including children in the congregation's worship, using the Revised Common Lectionary, Carolyn C. Brown, 2015. 2014 2011. The Word, Anna Shirey, Anna's Hosannas, Children's Lesson for Christmas, 2010. "Jesus - Light of the World," Illustrating the Story (lessons, children's sermons), coloring pages, activity sheets, crafts, children's songs. MSSS Crafts. "Reflecting the Light," and "Jesus and the Three R's," Charles Kirkpatrick, Sermons4kids.com. "Jesus Is the Living Word of God," Sunday School Lessons: Family Bible Study, art projects, music, stories, etc. Gospel Puzzles for the Lectionary, John 1:1-18, Mark Ryman, edoxy.com. "Special Delivery," Jim Kerlin, childrensermons.com. "A Voice Cries Out...: Creative Approaches to Selected Scripture Readings for Advent," Douglas Macomber, Reformed Worship. "The Writer," John McNeil, dramatix. Clip Art, John 1:14, Fr. Richard Lonsdale, Resources for Catholic Educators. Clip Art Images: John 1:1-14, Misioneros Del Sagrado Corazón en el Perú. John 1:5-8, John 1:5-8, John 1:14, John 1:5, Heartlight - Free Christian PowerPoint Backgrounds. John 1:1-18, at Cerezo Barredo's weekly gospel illustration. Liberation emphasis. "The Word Became Flesh," video, The Work of the People. "Light of the World," John 1:1-14, graphics/films/worship ideas from Lumicon. Hymns with Scripture Allusions: John 1:1, 2, 3, 4, 12, 14. The Cyber Hymnal. "At the Start There Was the Logos," TEXT: Mark Ryman (2004) based on John 1:(1-9), 10-18. TUNE: "Erie," by Charles D. Converse (1868). New Hymns for the Lectionary.